Xander Demos is one of today’s premier shred metal guitarists. Based in Pittsburgh, PA, he currently fronts his own band, XDB and has performed as a member of national tribute act, James Rivera’s Sabbath Judas Sabbath, as well as playing in Rivera’s solo band and Pittsburgh cover band, Raised On Radio. Xander performs in excess of 100 times a year, and he is active in recording collaborations with artists all over the world. Xander plays guitars from Suhr, McNaught, Brian Moore and Conklin, with whom he has endorsement deals. His endorsement from these guitar companies is a testament to his impressive skills and his deep commitment to playing the best guitars in the world. Xander’s style ranges from the beautifully melodic to the jaw-droppingly insane. 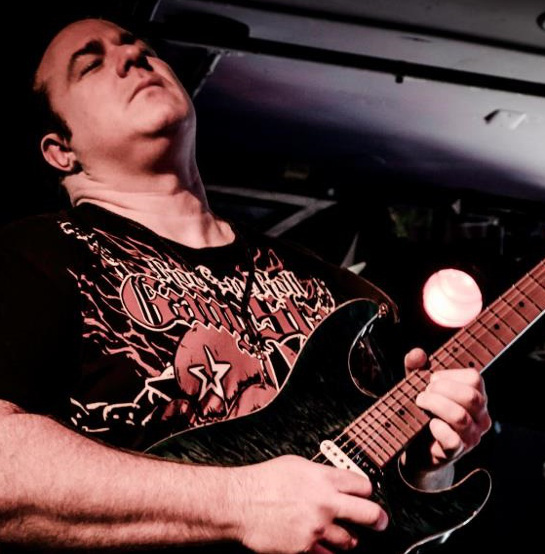 His playing encompasses much of what he has learned and absorbed from other players over the years; artists like Shawn Lane, Eric Johnson, Steve Vai, Vinnie Moore, Jason Becker, Neal Schon, Michael Romeo and John Sykes. One constant in his music is a focus on strong guitar melodies. In 2012, Xander released his debut solo CD, Guitarcadia. Mixed by CJ Snare of Firehouse, the album was named among the Best Albums of 2012 by Hair Metal Mansion. Recently, Xander has been making quite the name for himself and his solo band by appearing as support for acts like Symphony X, Stryper, Metal Church, Adrenaline Mob, Buckethead, UFO, Lizzy Borden, Kip Winger, Neil Zaza and Dio Disciples, as well as performing at Rock Harvest II, Wolf Fest, Skull Fest and NAMM Metal Jam. Xander’s videos have received more than 500,000 Youtube views, and Xander has regularly been featured on The Real Radio Show with AJ Pero of Twisted Sister, Steve Vai’sGuitarTV.com, GuitarWorld.com, Hair Metal Mansion, Iron City Rocks, Metal Temple, Bravewords and many other top rock and metal shows and websites. In August 2012, Xander was named Guitar Shop TV’s New Artist Showcase Winner. Named the 2013 Iron City Rocks Pittsburgh Music Awards Guitarist of the Year, Xander’s playing appears on several releases from other artists: Ged Rylands (Ten, Tygers of Pan Tang,) Derek Buddemeyer (Down Boys Records) Modern Superstar and Liberty ‘N’ Justice’s long awaited “Cigar Chronicles,” also featuring George Lynch (Dokken) Jeff Labar (Cinderella) and Jerry Dixon (Warrant.) He was included on “Guitar Feast” a compilation of international guitarists. His latest single release, “Dancing Through Daggers” was mixed by JK Northrup of King Kobra/XYZ fame. Xander was nominated for 3 awards at the 2nd Annual International Music and Entertainment Association Awards in 2014, as well as being nominated, once again, as Best Guitarist in the 2014 Iron City Rocks Awards. In addition to these accomplishments, Xander is an avid animal lover. Always looking for projects that will aid these beautiful creatures, Xander is donating a portion of his album sales to the ASPCA. Xander plays: V-Picks, the Fractal Audio Axe-FX Ultra as well as Hughes and Kettner amps, Matrix Amplification, Mission pedals, ISP Guitar Systems and Suhr Guitars, Amps & Effects, McNaught Guitars, who completed production of the first Xander Demos Signature Guitar, Conklin Guitars and John Dixon Cases. Many of Xander’s guitars are outfitted with EMG pickups and accessories. He exclusively uses the FloydUpgrades tremolos or the GraphTech LB-63 piezo-equipped Floyd tremolo. He also is endorsed with Rock-N-Roll GangStar Apparel, Lampifier Microphones, JH Audio In-ear monitors, and INTEX Cables.